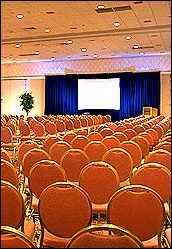 Presentations are included in many meetings. They can be interesting and informative or dull as dishwater. You don't want to be the one giving the boring presentation so take some time to prepare. Every presentation needs a plan. Short, effective presentations are often the result of carefully editing an hour long boring slideshow down to a concise 15 minutes, and ending up with a huge success. Use the presentation checklist to help jog your memory as to what needs to be taken into consideration. When presenting, remember that even if you have planned well and have all your facts and figures together you could still get it wrong if it is poorly delivered. Remember to smile when appropriate, certainly at the beginning and end. Maintain eye contact and ensure you include everyone in the audience. Stand comfortably and firmly with your feet slightly apart. Be confident. Don't worry about the odd mistake, everyone makes them. Dress appropriately, you don't want to draw attention away from the presentation by wearing a hideous tie or outrageous jewellery. The introduction must establish your credibility and tell the audience what's in it for them. Let them know why they should give you some of their time. Find out if you are to be introduced before you start your presentation. If you are, tell the introducer what to say to ensure that you are accurately introduced. Your opening remarks should provide the impact required to get the presentation off to a good start. Effective openings include short stories, quotations, relevant facts and examples. As you begin you may also wish to tell the audience how long the presentation will take, if breaks are planned (for longer sessions) and when they can ask questions (during or after). If you wish people to remember you and respond to your presentation then the content must be interesting, informative and relevant to them. Think about where you are going and stick to the shortest route. The information must flow logically so people can follow your ideas. Include attention grabbers where necessary but remember that is most effective to maintain a steady delivery than to put the audience through the ups and downs of a roller coaster ride. Support your case with facts, figures, examples and references. Bring it home to the audience by using examples that will help them apply your ideas to their own situations. Sell them on the idea by clearly stating the benefits. Any idea that you want your audience to remember needs to be repeated. You should vary the manner in which you repeat the important points but get it in there at least 3 times, more if possible. Visual aids are helpful in presentations and are often used to appeal to different senses, focus the audience's attention, create a change of pace, aid understanding, create a more last impression, reinforce and provide reference material. There are a variety of aids you can employ such as acetates, PowerPoint slideshows, videos and product demonstrations. Be careful to make sure that everyone can see whatever aid you are using. You may wish to provide hand outs if the slide show, for example, includes a lot of numbers or small writing. There are powerpoint designers available who can help you creating a professional presentation. And don't overdo it. Keep slides to a maximum of five, limit the number of charts shown and how much is on each one. And always look at the audience when speaking or they may not be able to hear you as well. You can point to the screen or chart and then turn back to the audience to continue speaking. You will most likely take questions at the end even if you allowed questions throughout the presentation. After the Q&A session give another concise summary of the presentation's main points just in case the questions dislodged them from anyone's memory. It is important that you close the presentation on a positive note but take care to avoid hype and exaggeration. Concentrate on and reinforce the key issues that you want the audience to go away with. Speak directly to the audience rather than relying on a list of bullet points on screen. You must engage them and ensure everyone goes away discussing the key issues. Sum up and state your conclusion. Condense your main thought into a witty or colourful phrase.